Wow. This is happening! I am getting ready for my first designer convention – Protospiel-Milwaukee. This weekend I will be taking my game, Scoville, to have it played by other designers and see whether or not it actually has any potential. Protospiel is a board game designer convention where designers bring games that are in work. Then you can have your game played by other designers and you can return the favor. One of the best parts about this weekend’s convention is that I will get to meet a ton of great people in the board game industry. There are several designers that I follow on Twitter that I will have the privilege of meeting. What is especially nice about that is that those guys know what they’re talking about. Several of them have had games published. You can probably find them in your local game store right now. I won’t name any names so that I don’t exclude anyone, but I am definitely excited about meeting the designers face to face. Scoville – Can you breed the hottest peppers? I will be bringing Scoville. Scoville is a game about cross breeding peppers. As a player you take on the role of someone who has been hired by the town of Scoville to fulfill their recipes for the hottest peppers. To do that each round consists of an auction phase, planting phase, harvesting phase, and fulfillment phase. But the real highlight of the game is how the planting and harvesting works. The main mechanic of the field map is what I think has the most potential in this game. Each round players have to plant one pepper in the fields. Players can plant a second pepper for $6 if they want. Over the course of the game the fields get filled in. During the harvest phase players will move their pawn up to three spots. Each spot is a location between two fields. If those two fields have peppers on them, then that player will receive whichever pepper(s) is cross-bred from the two existing peppers. For example, if you move your pawn between a field with a red pepper and a field with a yellow pepper, then the cross-breeding result would get you an orange pepper. 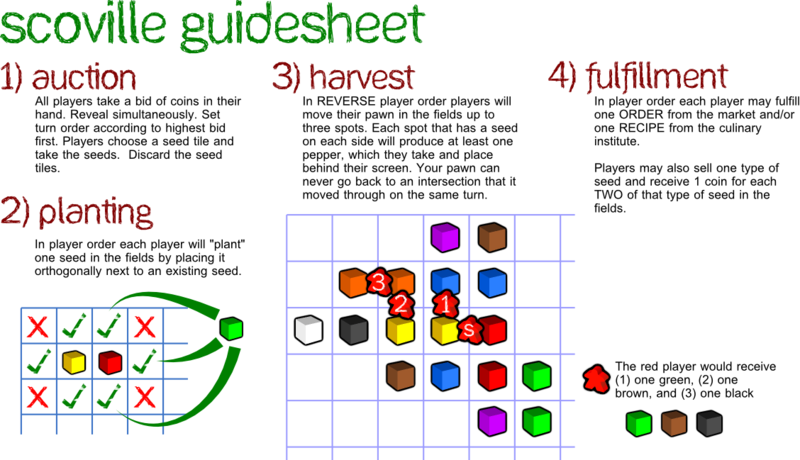 Part of the goal with Scoville was to create a game where players start with basic, or primary, resources (red, yellow, and blue peppers). Those basic resources can then be used to cross-breed better, or secondary, resources (green, orange, purple). Those secondary resources can then be used to cross-breed even better peppers (black and white). And finally if players can plant a black pepper next to a white pepper, the resulting cross-breed would be a gold pepper. I really enjoy the flow of this game where players are working toward getting the best resources while at the same time hesitating to plant the peppers that could give those resources since the fields are shared by all players. I have updated guides with the latest game revision that I will be using this weekend. It is mostly the same as what is shown. And there is already some buzz about the game. Not really. But I did fill out the game preview form on Cartrunk Entertainment’s Unpub.net website. You can read my preview for the game there: Unpub Preview – Scoville. Thanks go to John Moller for posting that! Write the rules – Yep. I guess I’m procrastinating here. But it is surprisingly difficult to put all your thoughts into rules on paper. And it can be tricky to make the most applicable images to add clarity to those rules. Finish putting together a second copy of the game. In the event of a publisher wanting to take a copy with them I’d like to have one available. In the 99.99% probability that no publisher wants a copy, then I want a second copy available to leave with a fine gentlemen for inclusion in the Prototype Penpal Program. I’ll probably have a long night tonight working on the rules. But if I get them done today it will give me time to revise them tomorrow. A second copy of the game is almost complete. I have everything printed. I just need to stick it to card stock and make some player shields. So since this is my first designer convention I want it to be the best it can be. That means I want to make great connections and I’d like to receive excellent feedback for Scoville so I can improve the game. Last week I posted a thread on BoardGameGeek: How to Make the Most out of a Designer Convention. I got some excellent replies. One common piece of advice from the thread and other sources is to have a good open attitude. This applies to receiving feedback for my own game and also to giving feedback for other’s games. Another good set of advice came on Twitter today from @BrettSpiel. You can read his ten tips on Cardboard Edison: Tips for Protospiel. So I think I am all set. I’ve got my game. I’ve got a good attitude. I’ve got a notebook for documenting all the awesome suggestions I’ll be receiving. And I’ve got a good friend attending with me as a play tester. It’s gonna be an awesome weekend! Posted on March 7, 2013, in Game Design, My Games, Scoville, The Boards, Uncategorized and tagged board game design, board games, convention, play test, protospiel, prototype, prototype penpal program, Scoville, unpub. Bookmark the permalink. Leave a comment.